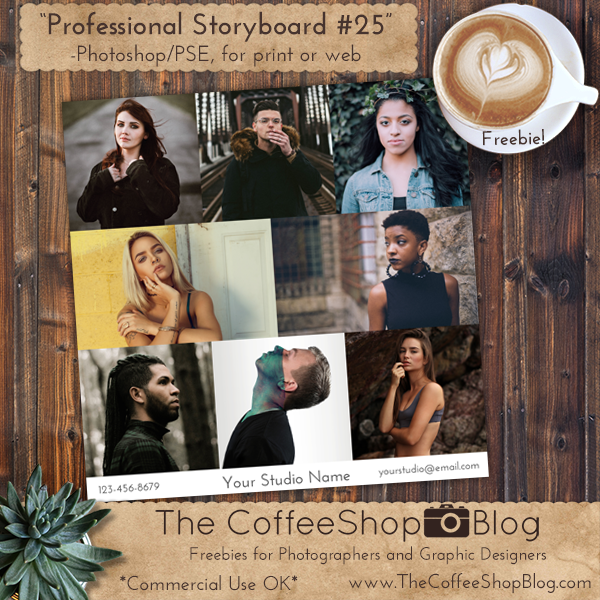 The CoffeeShop Blog: CoffeeShop Professional Photographer Storyboard #25! CoffeeShop Professional Photographer Storyboard #25! I am finishing up a new action that I will post tomorrow, so today I wanted to share a new professional photographer storyboard/blogboard. You can add your own text and change the bottom text box color and either print or post it on the web. It is a layered psd file so you can add your images using clipping masks (tutorial and free action). The images used in my example are all from Unsplash. Download the CoffeeShop "Storyboard #25".